We all know the irritation of having to hear a room full of rings and pings. Instead, of being one of those annoying people, you can silence your phone — but not miss a call or message alert. Set your phone to flash its camera light instead. 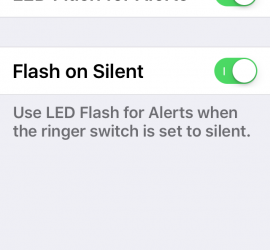 Then, when in a crowd, flip the silence button (iPhone) or silence your Android (if your version has this setting) and you’ll still have the flashing light. As long as your phone is in sight, you’ll know when someone seeks you. We particularly love this trick because it can be hard to determine whether the phone you’re hearing is your own, but the light is right there on your phone.